It looks like a broad portfolio, doesn’t it? And it is. But there are two unifying themes. 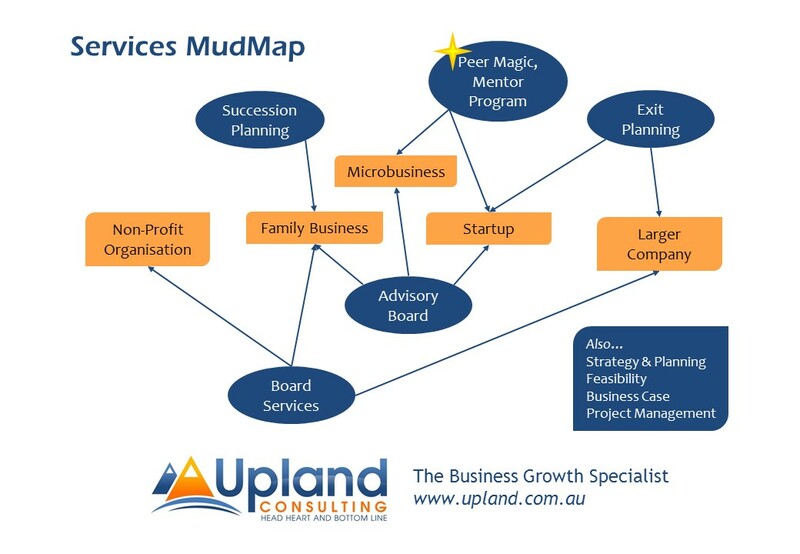 First, the work of Upland is to support business owners, and their teams, through all the stages of business evolution. From startup to exit, and everything in between. The support that will be most helpful to your growth depends on where you are on the path. You may need mentoring, the support of a structured peer group, an advisory board, or maybe an actual board of directors. You may be simply trying to get your weekends back, or you may be ready to plan for business succession, sale, or even a float. Somewhere along the path you will certainly need the things a good board works on: strategy, risk management, governance and the rest. Upland can help you with all of those. But we won’t commit to any services until we first fully understand what is going to be best for your business, right now. If your business is small, and thinking about a board is just irrelevant, the good news is this. Upland’s programs and services are crafted around the conviction that small businesses, even microbusinesses, can and should have access to the tools that larger companies use. Second, our work together is always going to be about the human connection, and about your “helicopter” overview as a business owner or director. You will need specialist advice, most certainly. You’ll need experts you can depend on in areas like accounting and finance, the law, employing and managing staff. But the focus of Upland’s services is always going to be you, and the people around you, as human beings. Our job is to help you make sense of the big picture. So where do NFPs fit in? We see them as businesses in disguise. The name can be misleading, because nothing in the constitution or governing legislation of these “non-profits” prohibits then from making a profit — although they may prefer to call it an operating surplus. In fact, if their financial performance and position is not strong, they’ll go under, so they must make a profit. The critical difference is, they cannot distribute a profit (as in dividends), so they are free to devote their resources to furthering their purpose. A better name would be “for-purpose” organisations. And you know what? There’s a convergence here. Just as people are more and more expecting for-profit companies to be driven by a deep sense of purpose, NFPs are seeing that profit is not a dirty word. Profit is just a means to an end. The big mistake in the corporate world was to treat profit as an end in itself. So we are seeing more and more hybrid and social enterprise organisations, who see their mission as doing good, and creating wealth as part of that doing good.